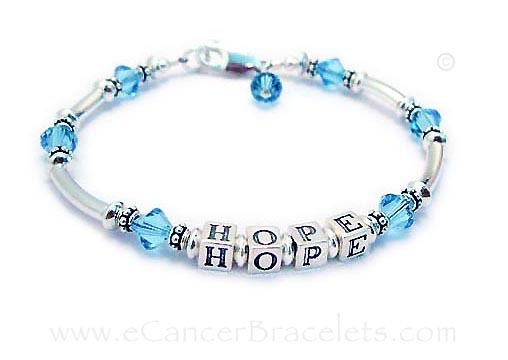 This HOPE cancer survivor (In memory, hope, courage, any name) bracelet is shown with light blue crystals and sterling silver Bali style beads. You choose the crystal colors during the ordering process below. You also choose the toggle or lobster clasp. A lobster claw clasp is shown. This bracelet comes with a matching crystal dangle. You may add a ribbon charm or any additional charms - see options below. Up to 9 letters are free. Additional sterling silver alphabet block letters are $4 each. 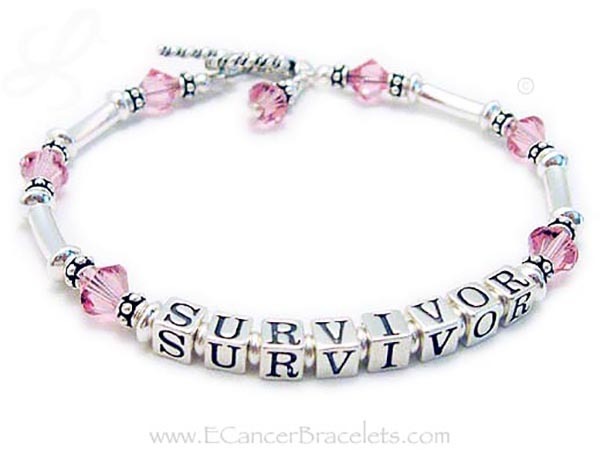 CBB-R37 Gallery of Inspirational Message Bracelets for Cancer Patients, Survivors and Friends. LIVE LOVE LAUGH charm and Small Beaded Puffed Heart Charm and Lobster Claw clasps with pink crystals for Breast Cancer Survivors. 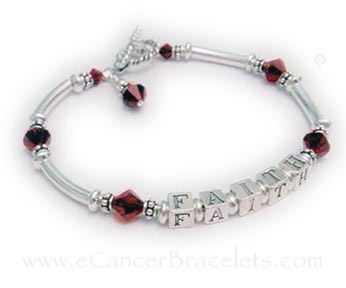 This is a January or Dark red Crystal bracelet. Size 7 1/4" - Price includes matching crystal dangle. 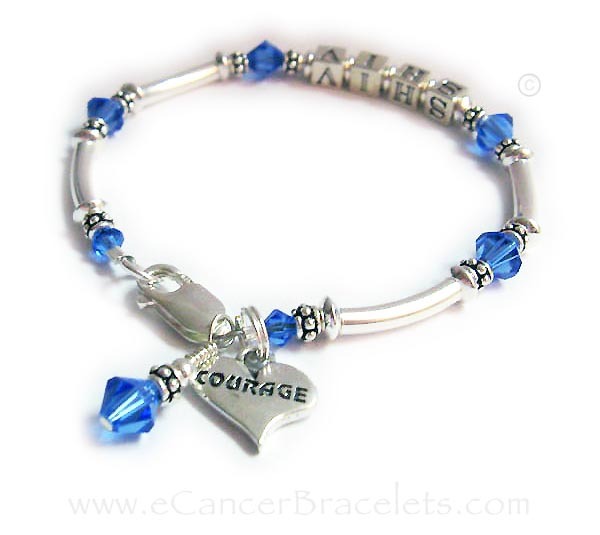 This bracelet is shown with Blue crystals which can signify prostate Cancer. They choose the September Birthstone Crystals, a lobster claw clasp and a COURAGE charm. Blue signifies a number of things including colon cancer. 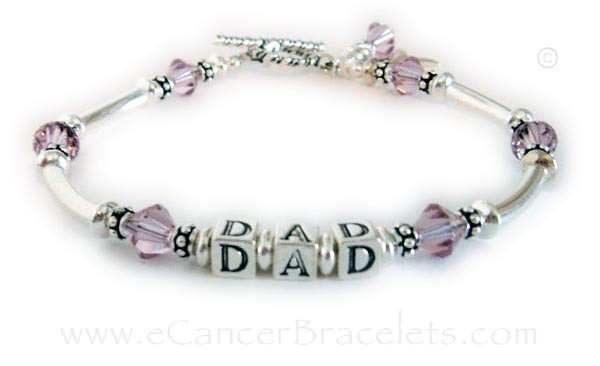 Shown with DAD and Light Purple Swarovski Crystals. Pink Ribbon Hope Bracelet. Shown with a Twisted toggle clasp. 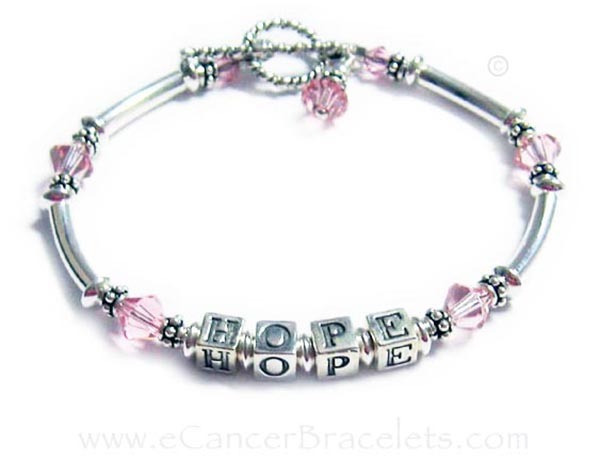 Shown with HOPE and Pink Swarovski Crystals.